Volume 26 Nimzowitch's "My System"
With 75 years of Improvements added. 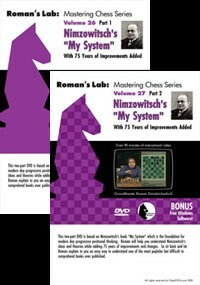 This 2-part DVD containing 4 hours of content is based on Nimzowitch's best selling book My System which is the foundation for Modern day progressive thinking. Roman will help you understand Nimzowitche's ideas and theories while adding 75 years of improvements, updates, and changes. Roman will cover both positional and tactical examples bringing to life one of the most popular books ever published. Volume 26 Nimzowitch's "My System" With 75 years of Improvements added. This 2-part DVD containing 4 hours of content is based on Nimzowitch's best selling book My System which is the foundation for Modern day progressive thinking. Roman will help you understand Nimzowitche's ideas and theories while adding 75 years of improvements, updates, and changes. Roman will cover both positional and tactical examples bringing to life one of the most popular books ever published.